We might not realize it, but as developers, we build inaccessible websites all the time. It’s not for the lack of care or talent, though—it’s a matter of doing things the wrong way. 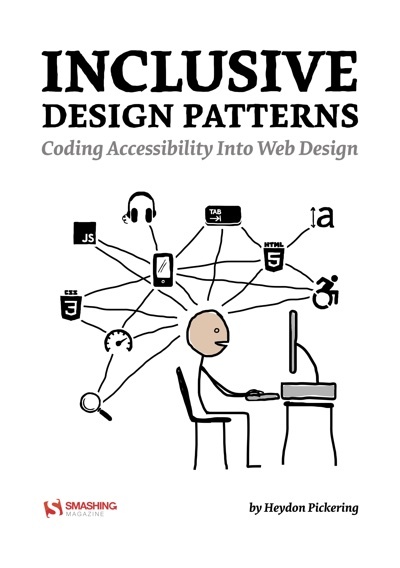 This book explains how we can craft accessible interfaces without extra effort—and what front-end design patterns we can use to create inclusive experiences. Accessibility has always been a slightly unsettling realm for developers. Surrounded by myths and misunderstandings, it used to be a domain for a small group of experts. Today, it’s still unclear what makes up an accessible interface and what developers need to know to get there. Let's fix it. Everything you need to know about accessibility gathered in one practical, smashing book. Heydon Pickering is a writer, designer and public speaker, the accessibility editor for Smashing Magazine, and an accessibility consultant working with The Paciello Group. He's interested in new and innovative ways to make the web an inclusive place. User research, systems thinking, and plain old semantic HTML all play their part. When Heydon isn't writing, coding or illustrating, he experiments with sound design and thrashes out Doom Metal riffs of his detuned SG copy.